There are specific times in History that cause a paradigm shift, where the established rules are changed and the way we live is substantially improved. June 1215 was one such time. The Magna Carta was an agreement between the Barons of Medieval England and King John. It was signed at Runnymede near Windsor Castle. In it were a number of promises between the king and his subjects which established how England would be governed. A fundamental change came as a result of the king raising taxation without consulting the people who bore the brunt of the payment. Matters came to a head and King John was forced to compromise his position as absolute ruler. A statement that is echoed in the American Bill of Rights and the Universal Declaration of Human Rights. This entry was posted in Paradigmeers on May 17, 2010 by dave5621. The scale of Mahatma (great soul) Gandhi’s influence needs to be viewed from the perspective of the time. India was ruled by the British and included what is now Pakistan and Bangladesh. There were deep spiritual divisions especially between the Hindus and Muslim populations and the caste (class system) was inextricably set, dividing the rich from the poor. From this, Gandhi rose to be the leader of the Indian Nationalist movement against British rule. His doctrine was to achieve this without the use of violence. He challenged all the rules in a massive way which is symbolised in the Dandi March starting from the Sabarmati Ashram on March 12th, 1939, and culminating at Dandhi, a coastal village in Gujarat, on April 6, 1930. This was a protest against a salt tax and Gandhi chose to make this a defining moment in the struggle against injustice but also as a medium of dialogue and communication with people along the route. For those of you who aspire to achieve improvement, we all experience times when politeness and persuasion seem to be yielding no results – this is the time when there can be more. This entry was posted in Paradigmeers on May 10, 2010 by dave5621. ‘Cometh the hour, cometh the man’ is a proverb that gives us another set of Paradigmeers. Here are a group of people who changed the rules and as a result, the outcome in response to a particular situation. The GB Cycle Team at the Beijing Olympics provides us with an excellent example of this genre of Paradigmeer. With a few notable exceptions such as Hugh Porter, Barry Hoban, Chris Boardman, Graeme Obree and Robert Miller, British Cycling had not dominated the cycling world. At the Beijing Olympics they did, winning seven out of ten gold medals and making Bradley Wiggins, Chris Hoy, Victoria Pendleton and Vicky Romero household names. Throw Mark Cavendish into the mix and now ask how this has happened. British Cycling Performance Director, Dave Brailsford, took the job in 1998 and changed the rules. The philosophy of ‘aggregation of marginal gains’ affected training, recovery, bikes, clothing and psychology and the paradigm shifted. Some of this must be attributable to the emergence and development of talent but there has to be more to it than this because it would be highly remarkable for so many world class athletes to be performing in the same era. GB Cycling took a different approach to the preparation of their team to achieve Olympic success. 2010 has seen the Sky sponsored team competing in the major professional road races and tours around the world with their aim of achieving a British winner of the Tour de France. Bradley Wiggins leads the way starting with the Giro d’Italia starting on 8th May and the Tour de France on 3rd July. This entry was posted in Paradigmeers on May 3, 2010 by dave5621. There are few people who have changed the world to such an extent and yet have become confined to relative obscurity than Tesla. You would not be reading this had Tesla not invented alternating current (AC) as a means of producing and distributing electricity. He quite literally has powered the world for over a century. Born in Serbia in 1856, he emigrated to America in 1884 where he found employment with Edison for one year until Edison failed to pay him for work he had done repairing machinery and they parted company. Tesla went on to become renowned for his electrical inventions that were far ahead of their time. He created alternating current power generation, alternating current transmission, radio, auto ignition, the first hydro-electric power station at Niagara Falls, fluorescent tubes, a version of the X-ray, the Induction Motor, Tesla Coil, Bladeless Turbine, and Laser Beam to name but a few. This technology even went as far as testing an electric car which used no batteries, just transmitted energy and an 80 horsepower alternating current motor. It drove around for a week, often at speeds up to 90mph. A Paradigmeer is not someone who just invents something; they are people who think differently, they change the rules and make a difference to our lives as a result. On all these counts, Tesla is undoubtedly a Master Paradigmeer. He also encountered the establishment, those people who had most to lose from everyone else’s gain. The utility companies, oil companies and their patrons like JP Morgan didn’t want Tesla to succeed in his dream and did everything in their power to stop it happening. They were so successful that Tesla’s notes have been lost to top secret vaults and aspects of his scientific reasoning discredited after his death in 1943. Tesla’s time will come again. He transformed the world in the last century with his mastery of electricity, there is every chance that he will transform the world in this century when his know-how on free ‘single point energy’ becomes more widely exploited by scientists and engineers as the lack of fossil fuels forces a change. Bring it on! This entry was posted in Paradigmeers on April 26, 2010 by dave5621. I’d like to thank my good friend Mike Rix for the following brilliant historical example. It shows the best of Paradigmeering from the English Army, especially since the risks associated with failure were so high. On the flip side the French brilliantly demonstrated the antithesis of Paradigmeering and suffered the consequences. 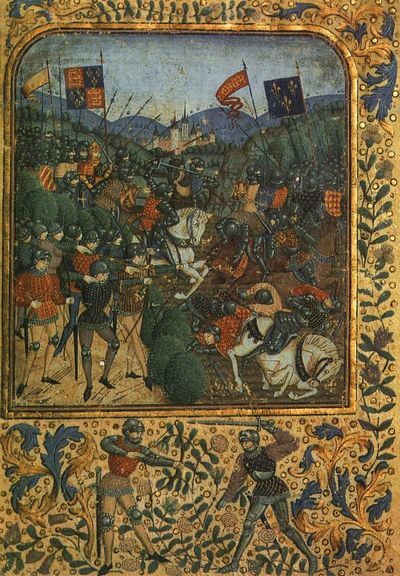 In 1346 the English led by Edward III were fighting in France. On Saturday 26th August, 1346 the Frankish Knights had caught the English Army at Crecy in northern France, with a view to annihilating the English invaders. Their confidence was quite justified, since they hadn’t been beaten in battle for 300 years and were considered (particularly by themselves) to be the best fighting force that had ever existed. Heavily armoured knights on horseback vastly outnumbering the English peasant army, it would be a walkover. In fact they were so confident of success that they didn’t begin the battle ‘til 3:00 in the afternoon because they wanted to have lunch before they started. The English had a new weapon, not tried or tested in a major battle before, their longbows. This low tech solution was all that stood before them and the most technologically advanced war machine of the day. The result was unexpected, especially by the Frankish Knights, and probably by the English too. 10,000 French knights lost their lives to the English arrows. The English hadn’t played by the assumed rules of engagement. This so infuriated King Philip VI of France, that he complained to the Pope about the ‘un-chivalrous English tactics’. The English had shifted the paradigm of battle but alas the French mindset did not change accordingly and the whole scenario was repeated 40 years later at the battle of Poitier and famously again at the battle of Agincourt 70 years later! It is easy to understand the mindset of the Frankish knights since they were highly successful and were continually improving their ‘technology’ with thicker armour plate and stronger horses. It is difficult to turn your back on that which had been hitherto so successful and consider alternatives which fly in the face of all your experience and learning. So how had the English managed this? What prompted the English to risk all on the longbow? Who persuaded Phillip III to break with convention? As the leader he was prepared to take the risk, one which could have cost him his life. How many leaders today are this committed to innovation? This entry was posted in Paradigmeers on April 19, 2010 by dave5621. Have you noticed that every so often you need a word to describe something and every word you try isn’t quite right? You need a word that is somewhere in between those other words. At which point you can give in and use something that you feel is unsatisfactory… or do something different. I wanted a word which would describe those brilliant, brave, enlightened souls who were dissatisfied enough with conventional wisdom to ask if there could be another way? My choice is to define what I mean by it and then create an appropriate word. To start with, they are people who have been a catalyst of change; those who have created a ‘step change’. Most of the time change is evolutionary, where a succession of improvements continually refines that which already exists. Rules are created; ‘this is the way we do it ‘round here’’ becomes the mantra. Taking a different approach becomes very difficult, because the rules, written and unwritten legislate against it. Take sports coaching as an example, where athletes learn the techniques that allowed others to be successful. This is how you serve like Roger Federer at tennis, or Arnold Palmer swings a golf club, or get your wet suit off at the transition phase of a triathlon ‘like the pros’. We copy their technique, practice their technique, and perfect their technique. A set of rules develops, at first unwritten, then fully formatted soon to be followed by the means of policing. Practices become established and entrenched. Add the greatest disempowering factor – mindset. People believe that this is the ‘best’ way of doing things to the exclusion of anything other than refinements and evolutionary progress. It is not in their best interests to do anything different, they have become expert practitioners whose power and prestige are reliant on upholding the status quo. They actually become highly proficient in ensuring their position is protected; they have no interest in doing anything which threatens their position. They create restrictive practices to prevent their position from being eroded. In every aspect of our lives you can see this happening, just examine your work life, business, politics, energy, banking, law, medicine, education. How many things do you do that are governed by rules, processes and accepted convention? Who are these people? What makes them think differently? Why do they take such risks? What triggers them to take action? What can we learn from them if, in our own way, we want to take ourselves, our team, our organisation, our industry to the next level. I needed a new word so I called these people ‘Paradigmeers’. A person or persons who undertakes to change the rules and create a new reality. Someone to be admired! We’ll share our ‘Paradigmeers’ with you and maybe you could suggest a few to be considered. There will no doubt be things they have in common, but I shall specify no further as heaven forbid, this could well create a set of rules! So far the only rule is that they changed the rules to create a new reality. Our hope is that this will inspire you and others to risk changing the rules to create a better world. As we look more closely at Paradigmeers so you’ll see how they have been responsible for enabling wonderful changes to occur. Some of our nominees are obvious Paradigmeers, other less well known, some have been successful whereas some have yet to receive the adulation that we think they truly deserve. This entry was posted in Paradigmeers on April 12, 2010 by dave5621.